This is my very first monthly favorites post! Eeek, I’m super excited about it so let’s get into it!!! First up is an oldie but goodie and it’s the Anastasia Beverly Hills Modern Renaissance Palette. The colors in this palette are perfect for Spring. We have pinks, berries, transitions, and of course light shimmery colors. Next up is the Sweet Peach Palette by Too Faced. Again, these colors could not be any more perfect for Spring. We have peach colors, transition colors some dark colors, and the palette smells delicious! And last but not least is my newest addition, the Violet Voss Ride or Die Palette. There are soo many beautiful colors in this palette. We have light, dark, shimmery, and matte. The colors are super blendable and the possibilities are endless with this one! 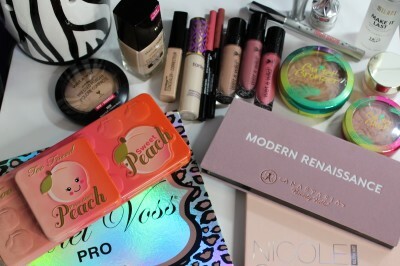 These eyeshadow palettes will definitely be riding with me into April that’s for sure! For foundation, I’ve been using the Wet n Wild Photofocus Foundation non-stop! It’s affordable, full coverage and just so good. I am absolutely loving it! For powder, again I have to say the Wet n Wild Photofocus Pressed Powder is the one I just keep grabbing for. I have two picks for concealer, first up, you guessed it! It’s the Wet n Wild Photofocus Concealer. It’s full coverage, affordable and just a great drugstore concealer. The next one is, of course, Tarte’s Shape Tape Concealer. Full coverage and just overall amazing!! First up, is the Too Faced Papa Don’t Peach Blush. I’m loving this blush, it’s perfect for Spring, very pigmented and gives off a nice peachy glow. Next up, is the Physician’s Formula Butter Blush in Plum Rose. This is a very light dusty rose color with a butter smooth texture. Did I mention that it smells amazing too?! My pick for bronzer is Physician’s Formula Butter Bronzer. It’s just that perfect shade of bronzer, again it has a super smooth texture and smells delicious! For lipsticks, hands down the Wet n Wild Megalast Liquid Catsuit Matte Lipsticks have been my favorite! They are long wearing yet not super drying on the lips. The colors I’m loving are Nudie Patootie, Rebel Rose, and Pink Really Hard. For Lipliners, again, Wet n Wild Perfect Pout Gel Lip Liners. They are also long wearing, glide right on and affordable. My faves are Bare to Comment and Never Petal Down. Hands down it is the Anastasia Beverly Hills x Nicole Guerriero Glow Kit!! I’m in love with every highlight in this palette, to be honest. If I had to pick the highlights I’m using the most, I’d have to say Forever Young and Forever Lit. This month I have to say it’s the Benefit Ka-Brow, Ready Set Brow, and High Brow. I’ve actually had these for a while. If I’m being honest, I’m more of a brow pencil girl, but I just seem to be grabbing these most days lately. For setting spray I’m using the Milani Make it Last Setting Spray every day! I love it! It’s affordable, keeps my makeup in place all day, and it smells so good! Another Milani Product that I’m using every day is the Keep it Smooth Luxe Lip Treatment. I apply this at night before bed and also under my lipsticks. It doesn’t alter my lipsticks and keeps my lips feeling smooth yet not greasy. Again it smells delicious too! Well, that’s it, my beauties, they are my picks for March 2017! If you have any favorites that you’d like to share, list them in the comments section below! !